The Center for East Asian Studies offers a number of professional development opportunities for K-12 teachers in Kansas and Western Missouri. Our teachers' workshops are designed to enhance teachers' knowledge of East Asian culture and their ability to teach this to their students. To find what workshops we are offering, sign up for Outreach Notes, our outreach newsletter. To sign up, send an email to ceas@ku.edu. The Center also houses the Kansas Consortium for Teaching about Asia (KCTA), which offers professional development classes in East Asian history and culture for teachers interested in learning how to incorporate Chinese, Japanese, and Korean content into the curriculum for all subject areas and grade levels. Classes are given throughout the year in either face-to-face or online formats. To learn more, please visit www.kcta.ku.edu. 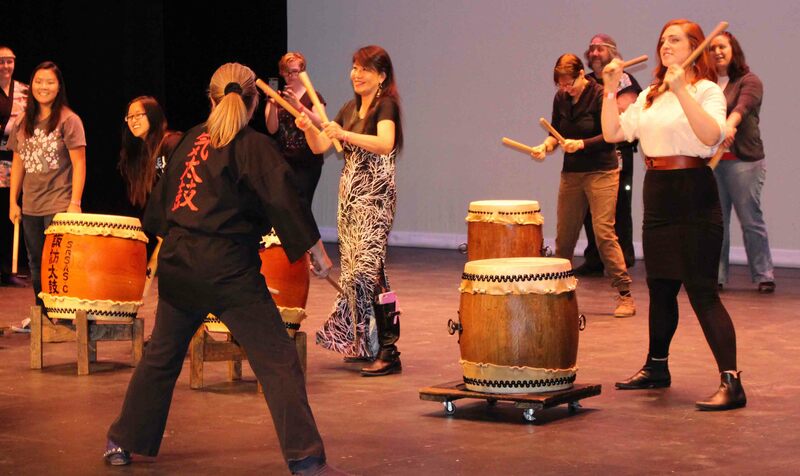 During a teacher's workshop at the 2015 Greater Kansas City Japan Festival, educators get a chance to try taiko drumming.